Marking the first anniversary of the return of Fidel Castro's property (Elian Gonzalez), Andrea Mitchell of NBC News was given permission by the Cuban dictator to visit the Gonzalez family. At the top of her report, Mitchell mentioned the fact that she'd needed Castro's approval, and then continued as if that fact had no bearing on the content of her story. Before proceeding to the Gonzalez home, Mitchell spoke for three hours with El Jefe himself, who used the opportunity to dispel speculation that he was in poor health, since suffering a brief fainting spell about a week earlier. One might think, gullibly, that an American reporter, given the chance to interview Fidel Castro, would rebuke his silencing of the press in his country. Mitchell, however, not only declined to risk offending him, but approached him with a complete lack of suspicion. So trusting was she that when she received roughly the same answers from Juan Miguel Gonzalez that she'd been given by Castro, she only became more convinced that they were truthful. Juan Miguel was free to stay with Elian in America, the official story goes, but he, and not Castro, decided that it was best to return to Cuba. Mitchell never asked Juan Miguel why he was so closely shadowed by Cuban government officials throughout the episode. Nor did she ask why, if Elian's father was supposedly free to stay in the U.S., his mother wasn't free to come here in the first place. She accepted without question Juan Miguel's statement, echoing Castro's, that he and his family were receiving no special treatment. If she'd been behaving as reporter, she might have quizzed Juan Miguel about how much they'd been receiving in egg and milk rations, and possibly even asked to look inside his refrigerator for confirmation. She might also have asked if "no special treatment" meant that, when Elian is eleven, he will be subjected to slave labor in the sugar cane fields, like all other Cuban children. In trying to convince Mitchell that all is well in the Gonzalez house, Juan Miguel told her that Elian gives no indication of even remembering his experience in the U.S. He doesn't talk about America, doesn't talk about his relatives in Miami, doesn't talk about his mother's death, his rescue, or his seizure at gunpoint by total strangers. Assuming this is true (an assumption which itself defies natural journalistic cynicism), it does not mean, as is suggested, that a return to Cuba's pastoral simplicity has cured Elian of his harrowing exposure to decadent America. When told that all those memories had been suppressed, Mitchell should have asked about the nature of the "psychiatric treatment" Elian received upon his return. Better yet, she could have challenged the veracity of the claim. Juan Miguel showed her pictures of Elian's mother hanging around the house, and told her that Elian kisses them on holidays and birthdays. How could he then claim that Elian doesn't talk about his mother's drowning, or the events that followed? The presence of the photos doesn't ring true, either. From the time a Cuban child can read and write, he is taught to be blindly loyal to Fidel Castro. Parents are not even allowed to retain custody of their children, if they are judged to have been unsuccessful in nurturing that loyalty. Children of defectors are taught to despise them as traitors, not to maintain miniature shrines in their honor. The fact that these photos were present at this government-arranged meeting should have caused Mitchell to wonder aloud whether anything she had seen or heard on her visit was genuine. Although Andrea Mitchell was brought to Havana to see what a normal, well-adjusted, happy communist boy Elian had become, she was not allowed to speak to him. This didn't faze her one bit. She readily accepted the explanation that Castro wanted to protect the boy from the exploitation he'd been subjected to by the American media and the Gonzalez family in Miami. There's no way anyone can believe that Fidel is at all squeamish about exploiting Elian in front of the cameras. Last Christmas, the whole world was treated to the image of El Jefe giving a present to the ordinary boy who gets no special treatment. He wasn't singling Elian out for exploitation, though. The big-hearted lug probably hand-delivers Christmas presents to every child in Cuba. There was also that putrid Father's Day letter allegedly written to Castro by Juan Miguel, and signed by Elian, which said, "On this Father's Day we want to send you an affectionate greeting and a deserved kiss from all of us. Especially to the father who we love very much for his unequaled teaching and infinite love." Not only was this exploitative, but it announced, to all who would listen, that when Elian was returned to his "father," that meant that he would be placed in the possession of Papa Fidel. It seems, unfortunately, that Mitchell would have found it rude to mention this to her gracious host. Of course, if Mitchell had asked Castro any inconvenient questions, she would never have been allowed to interview Juan Miguel -- and if she'd tried to make Juan Miguel deviate from his script, she'd never be allowed back in Cuba for as long as Castro is alive. The threat of losing access to political leaders is often used to pressure reporters into giving them more favorable coverage. The Clinton White House, for example, used that threat to persuade networks to cancel interviews with Unlimited Access author Gary Aldrich. The nature of this relationship is what makes events like the White House Correspondents' Dinner so unethical. A journalist who attends the dinner one year risks being crossed off the next year's guest list if he gets on the president's bad side. Before writing a story, a reporter might think to himself: on the one hand, the people have a right to know ... but on the other hand, that poached salmon was just to die for. To a member of the Washington press corps, that's what's known as a moral conundrum. This motivation doesn't explain everything, though, because it doesn't work equally for all parties. If President Bush tried to pressure CNN into canceling an interview with one of his critics, not only would the people at CNN not comply, but they would run a series of reports accusing the president of shredding the First Amendment. The news media don't place nearly as high a value on their access to Republicans as they did on the chance to get close to their heroes in the Clinton administration. Reporters and news anchors who cover Washington tend to be left-wing political groupies. To them, the difference between Democrats and Republicans is like the difference a teenage boy sees between Christina Aguilera and Liza Minelli. This groupie factor was clearly present in Andrea Mitchell's report, because being in Fidel Castro's presence was the only thing she got out of it. There was no need for her to even travel to Cuba in order to pass along Castro's prefabricated report. Since she didn't question what she was told, she could have received the information just as well from a postcard. The message could have read: "Dear Ms. Mitchell, -- How are you? I am fine. Elian is fine. Elian's baby brother is fine. El Jefe is fine. The weather is fine. Hope you and Mr. Greenspan are also fine. Wish you were here. -- XOXOXOXO, Comrade Juan Miguel. -- p.s., This is a completely authentic and unedited communication. Just thought I'd tell you that, of my own free will." That would have gotten Castro's official line across just as well as sending Mitchell on a Cuban listening tour, but it would not have suggested to passive viewers that his story had been investigated and corroborated. Nor would it have granted Mitchell her coveted assignment, and made her the envy of her colleagues. Castro's popularity among the American press could not have been more obvious during the Elian Gonzalez saga, when journalists stepped all over each other as they went running to ingratiate themselves to him. For starters, the communist dictator was as a rule referred to as the Cuban "president," a term which rightly applies only to the elected leader of a democratic republic. The moral equivalencies didn't end there. The Media Research Center catalogued dozens of similar but more specific examples of bias in a Special Report issued in May of 2000, a small sampling of which will be cited here. One of the most shameful displays came, predictably, from NBC Today show co-host Katie Couric, who suggested that Cuban immigrants in Little Havana are a greater threat to freedom than Castro is. "Some suggested over the weekend that it's wrong to expect Elian Gonzalez to live in a place that tolerates no dissent or freedom of political expression. They were talking about Miami," she snotted. Those simple-minded viewers at home probably thought she was talking about Cuba, until she cutely sprang the punch line on them. Notice that she didn't need to explain how a political protest can actually be a violation of free speech, since she unloaded the responsibility for that claim on "some." Reporter Jim Avila, also of NBC, told MSNBC host Don Imus that, "[Cuba] is mostly a nationalistic country, not primarily a communist country." Got that? It's not a communist country. It's only a nationalistic country with a communist government ... which forces its citizens to be nationalistic, or else it will send them to prison. Perhaps Avila's confusion on this point explains his inability to understand why Elian's mother would want to escape Cuba in the first place. "Why did she do it," he wondered. "What was she escaping?" Admittedly, if you don't believe that Cuba is a communist country, that question can be a bit of a stumper. Media analyses of differences between the U.S. and Cuba typically looked no deeper than the disparity in wealth, as if a lack of creature comforts was the only drawback to totalitarianism. Worse yet, they incorporated the traditional liberal prejudice that poverty is virtuous, thereby lending Cuba, in its squalor, a presumption of moral superiority. Michelle Singletary, a columnist for the Washington Post, was led on a tour of Havana, where she was shown what a swell place it is to raise children. Obediently, she reported that, "What I see are sweet-faced children -- and intangibles that transcend all foolish materialistic arguments about who's better off where. I could see no reason why Patricia [a young girl she met there] would be happier anywhere else than with her mother, even though her mother doesn't have many 'worldly' possessions." A Newsweek magazine report by Brook Larmer and John Leland concurred with Singletary's Norman Rockwell portrait of Cuba, suggesting that Elian Gonzalez would be better off there, not because he'd be with his father, but because, "The boy will nestle again in a more peaceable society that treasures its children." Well, "treasures" may not exactly be the right word; "owns" is more like it -- but why split hairs? Jim Avila, for one, is convinced that Elian isn't even much worse off materially than if he'd stayed in the United States. While reporting from Havana (which only Castro-friendly journalists are allowed to do), he assured America that, "Elian's future here is likely to be the Cuban good life, lived by Communist Party elite with perks like five free gallons of gasoline a month for the family, a Cuban tradition called 'La Jaba' -- the bag -- which includes extra rice, beans, cooking oil and sundries like deodorant, shampoo, razors and shaving cream, about fifteen dollars a month worth of basics." While Castro's apologists complain that America is too materialistic, they have no qualms about somebody selling out his family's freedom in exchange for an ordinary bag of groceries. If Cuba is such an ideal place to bring up a family, then that explains the media's treatment of the Cuban-Americans in Miami. If the only advantage to the United States over Cuba is wealth, then those people who left Cuba for the U.S. must have acted out of pure greed. The last thing one would ordinarily expect from the hypersensitive liberal media is racial stereotyping, but when an ethnic group, like Cuban-Americans, votes consistently Republican, an exception can be made. Mind you, no slurs ever attached themselves to those Cubans still living under Castro's control. It was only in Miami's Little Havana where all that hot Cuban blood was boiling over, among those hard-line fanatical zealots who could at any moment, howyousay, crazygonuts. Reporters uncritically passed along Castro's warning about "the extremist Cuban-American mafia," his own variation of the Vast Right Wing Conspiracy. Furthermore, it was not Castro, but his critics, who were deemed to be paranoid. They were routinely dismissed as "Castro-haters," as if hating the man who'd enslaved, imprisoned and executed many of their relatives were some form of bigotry. While the people who attended state-sponsored rallies in Cuba were generously described as concerned citizens, those who took to the streets of Miami were derided as violent lunatics, despite the fact that they protested for months without incident. News anchors commonly mispronounced Elian Gonzalez's first name as "Alien," a not-too-subtle suggestion that he didn't belong in this country. 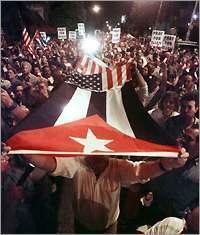 This status was soon extended to all Cubans living in Miami, even those who are already U.S. citizens. It became obligatory for news reports critical of the Miami protesters to refer to their city as a "banana republic," encouraging readers and viewers to perceive the people there as foreigners. Watching the American press at work, Castro must wonder why he bothers operating his own propaganda machine at home. He gives the American media a story, and they report it without asking any questions. He tells them who to interview, and who not to, and they obey. He identifies somebody as an enemy, and they instinctively attack. He's found himself an entire brigade of sycophantic loyalists, and he hasn't even had to threaten them, or bribe them with a bag of deodorant.